Available in standard and Gold editions. One Piece: Burning Blood will launch for PC via Steam on September 1 in North America and September 2 in Europe (it’s a timezone thing, the release is simultaneous), Bandai Namco announced. It will cost $49.99 for the standard edition of $74.98 for the Gold Edition including all of the downloadable content. Pre-orders for the PC version will include playable characters Luffy Gear 4th, Kung Fu Luffy, and Afro Luffy, as well as an additional 10 percent discount if you already own One Piece: Pirate Warriors 3 for PC. One Piece Burning Blood is a dynamic and colorful new fighting game featuring the world’s most famous pirate: Monkey D. Luffy. Devil Fruit / Haki Abilities – Devil Fruits and “Haki” can be used to do massive special moves and take down the fiercest opponents! One Piece: Burning Blood Gold Edition includes the game along with all the content from the Wanted Pack, Wanted Pack 2 and Luffy Pack! 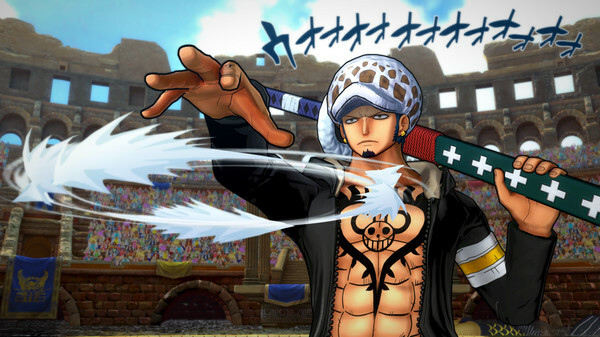 One Piece: Burning Blood is currently available for PlayStation 4, Xbox One, and PS Vita. Rob Lucci, Caesar Clown, and Monkey D. Garp are on the way as paid character downloadable content, and the “Gold Movie Pack” add-on featuring new playable character Gildo Tesoro is available now. Watch a trailer for the “Gold Movie Pack” add-on below.